There is a key shape (normally good shape) that doesn't have a Japanese name, and hasn't been christened in English - up to this point (...which was several years ago, and the name seems to be pretty widely accepted in english now, as of October 2009 .) Sometimes called a "loose mouth" due to similarity to the Mouth shape or loose bamboo joint, due to similarity to bamboo joint. 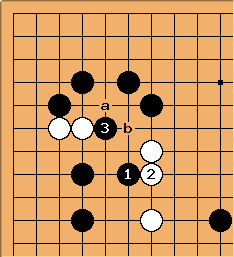 This may be more efficient than the bamboo joint, while doing a similar job - typically staying connected in an important, contested part of the board. Depending on just what white stones are around, there is also probably a greater chance of an eye being formed in the table shape due to shared properties with the Mouth shape. Here's an example from a game in which I (Charles) was taking a handicap from a pro. Black wants to cut White. There are several ways to do this. 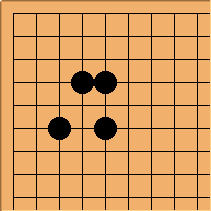 and make good shape, because now White a, Black b would be the table shape. Ear point contains another example of using the table shape. See also table building. See also tippy table.